Barton Rovers’ miserable home run continued as they made it eight games without a win at Sharpenhoe Road, losing 1-0 to Chalfont St Peter on Saturday. The hosts have now gone seven matches without a win and dropped closer to the relegation zone, while they have only scored once in the last six games. Both teams started well as Chalfont hit the bar with a speculative lob after only two minutes before Barton’s Alex O’Brien had a good effort saved by visiting keeper Montel Power-Simpson, who produced a man of the match display. After the break, Rovers came out strongly but Power-Simpson was to prove an unbeatable force, saving everything that came his way. The only goal of the game came when Jordan Davis’ shot was cleared by a last ditch challenge from Chalfont’s goal-line. No more than 10 seconds later home keeper Kyle Forster was picking the ball out of his net after a quality Anthony Mendy finish when he went through one-on-one. Despite Rovers throwing everything at Chalfont, Power-Simpson decked out in his borrowed Barton Rovers’ goalkeeper’s jersey, soaked up even the sharpest of effort. Davis had another shot cleared off the line before efforts from O’Brien, Paul Andrews, Duran Reynolds, Lucas Perry and Jack Keating failed to elude Power-Simpson’s grasp. 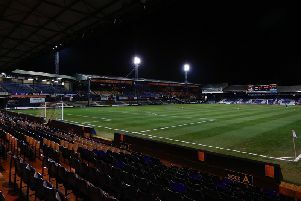 Rovers take on AFC Dunstable in the Beds Senior Cup final at Kenilworth Road this evening.